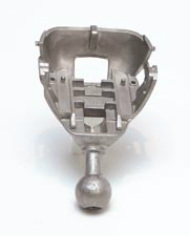 The North American Die Casting Association (NADCA) is the sole trade and technical association of the die casting industry. NADCA membership consists of both corporate and individual members from over 950 companies located in every geographic region of the U.S. These companies include custom die casters (who produce die castings for sale to others), captive die casters (who produce castings for their own use in manufacturing a product), and suppliers to the die casting industry. NADCA members can be found in every type of community across the nation, representing both rural and urban interests. The North American Die Casting Association (NADCA) also has an extensive government relations program based in Washington D.C. The program provides government affairs services to NADCA members. NADCA is the leading voice for the die casting industry in Washington, D.C. Policymakers, regulators, and lawmakers face decisions every day which affect manufacturers of all sizes and in every sector. NADCA works with members of Congress, senior agency officials and the White House to ensure die casters are represented when policymakers take action..
For information about joining NADCA, click here to visit our web site membership page.